The lack of safe access to decent toilets and other sanitation facilities has a substantial impact on the health and safety of men and women transport workers. We will be discussing the impact of the denial of this basic human right, and sharing successful strategies to win decent facilities, at the ITF congress in Singapore, in anticipation of World Toilet Day on 19 November. The illustration shows, not exhaustively, some of the situations transport workers are forced to cope with as part of their everyday working lives. We need your union’s contribution and worker stories! Let us know the problems that your members face, with stories and photos of …. 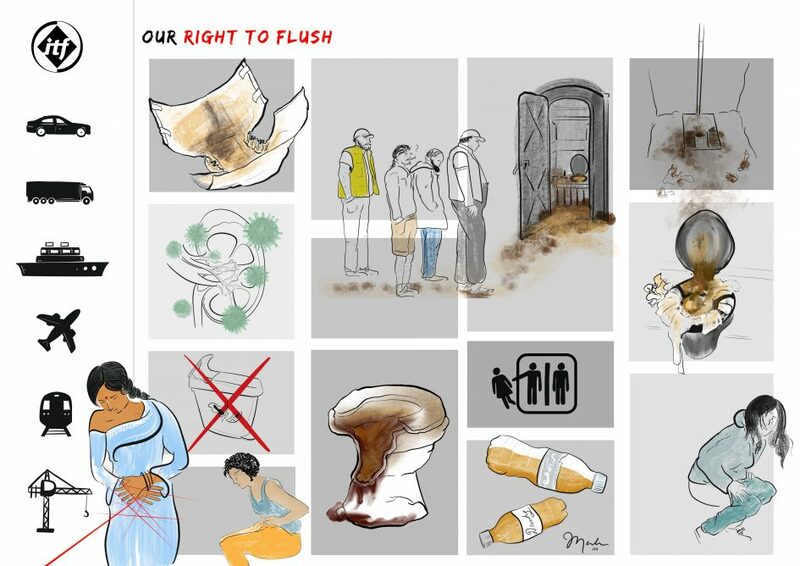 dirty toilets, broken toilets, temporary toilets, lack of women’s or gender neutral toilets, unsafe toilets, lack of sanitary provisions, alternatives to toilets that workers are forced to use – whatever story needs to be told. Even if you are not attending congress. Please also send us any quotes, anonymous or attributed, from workers or union activists/leaders about the impact of lack of decent facilities, or union campaigns around sanitation facilities for transport workers. Send all content to women@itf.org.uk by Monday 3 September.